Does the Call Need to Stand? I have a post over at the Hardball Times today about a way to improve replay review. Check it out! This entry was posted in Baseball, Musings, Strategy and tagged Baseball, evidence, MLB, replay review, rules on November 12, 2014 by clownhypothesis. Summary: I look at averages for hitters and pitchers in the postseason to see how their quality (relative to league average) has changed over time. Unsurprisingly, the gap between postseason and regular season average pitchers is larger than the comparable gap for hitters. The trend over time for pitchers is expected, with a decrease in quality relative to league average from the 1900s to mid-1970s and a slight increase since then that appears to be linked with the increased usage of relievers. The trend for hitters is more confusing, with a dip from 1950 to approximately 1985 and an increase since then. Overall, however, the average quality of both batters and pitchers in the postseason relative to league average is as high as it has been in the expansion era. Quality of play in the postseason is a common trope of baseball discussion. Between concerns about optics (you want casual fans to watch high quality baseball) and rewarding the best teams, there was a certain amount of handwringing about the number of teams with comparatively poor records into the playoffs (e.g., the Giants and Royals made up the only pair of World Series teams ever without a 90 game winner). This prompted me to wonder about the quality of the average players in the postseason and how that’s changed over time with the many changes in the game—increased competitive balance, different workloads for pitchers, changes in the run environment, etc. For each pitcher in the postseason, compute their Runs Allowed per 9 IP during the regular season. Lower is better, obviously. Take the average for each pitcher, weighted by the number of batters faced. Divide that average by the major league average RA9 that year. By using RA9, this is a combined pitching/defense metric that really measures how much the average playoff team is suppressing runs relative to league average. This doesn’t adjust for park factors, largely because I thought that adjustment was more trouble than it was worth. I’m pretty sure the only effect that this has on aggregate is injecting some noise, though I’m not positive. I considered using projected RA9 instead of actual RA9, but after playing around with the historical Marcel projections at Baseball Heat Maps, I didn’t see any meaningful differences on aggregate. For simplicity’s sake, I used major league average rather than individual league average, which could influence some of the numbers in the pre-interleague play era. While I wouldn’t put too much weight in the LOESS estimate (these numbers should be subject to a large bit of randomness), it’s pretty easy to come up with a basic explanation of why the curve looks the way it does. For the first seventy years of that chart, the top pitchers pitched ever smaller shares of the overall innings (except for an uptick in the 1960s), ceding those innings to lesser starters and dropping the average quality. However, starting in the 1970s, relievers have covered larger portions of innings (covered in this FiveThirtyEight piece), and since relievers are typically more effective on a rate basis than starters, that’s a reasonable explanation for the shape of the overall pitcher trend. What’s the upshot of all of this? This is an exploratory post, so there’s no major underlying point, but from the plots I’m inclined to conclude that, relative to average, the quality of the typical player (both batter and pitcher) in the playoffs is as good as it’s been since expansion. (To be clear, this mostly refers to the 8 team playoff era of 1995–2011; the last few years aren’t enough to conclude anything about letting two more wild cards in for a single game.) I suspect a reason for that is that, while the looser postseason restrictions have made it easier for flawed teams to make it in the playoffs, they’ve also made it harder for very good teams to be excluded because of bad luck, which lifts the overall quality, a point raised in this recent Baseball Prospectus article by Sam Miller. I used data from the Lahman database and Fangraphs for this article, which means there may be slight inconsistencies. For instance, there’s apparently an error in Lahman’s accounting for HBP in postseason games the last 5 years or so, which should have a negligible but non-zero effect on the results. 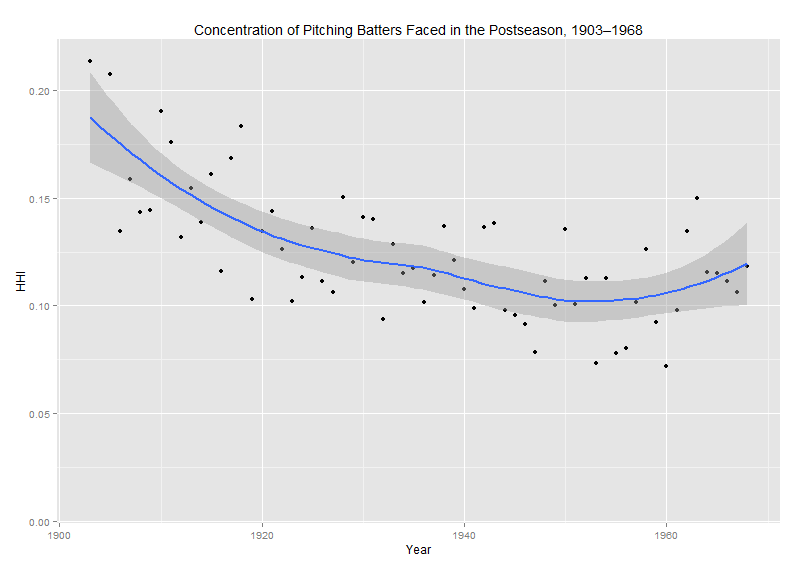 I mentioned that the share of batters faced in the postseason by the top pitchers has decreased steadily over time. I assessed that using the Herfindahl-Hirschman index (which I also used in an old post about pitchers’ repertoires.) The chart of the HHI for batters faced is included below. I cut the chart off at 1968 to exclude the divisional play era, which by doubling the number of teams decreased the level of concentration substantially. This entry was posted in Baseball, Baseball History, Research, Splits and tagged Baseball, Playoffs, quality of competition, wOBA on November 10, 2014 by clownhypothesis. Playing the A’s? Grow a Beard? I wrote an article for The Hardball Times about using subterfuge to obtain the platoon advantage. Check it out here. This entry was posted in Baseball, Platoons, Research, Splits on September 17, 2014 by clownhypothesis. Summary: Based on a suggestion heard at SaberSeminar, I use a few different means to examine how rookie umpires call the strike zone. Those seven umpires appear to consistently call more low strikes than the league as a whole, but some simple statistics suggest it’s unlikely they are actually moving the needle. Red Sox manager John Farrell was one of the speakers at Saberseminar, which I attended last weekend. As I mentioned in my recap, he was asked about the reasons offense is down a hair this year (4.10 runs per team per game as I type this, down from 4.20 through this date (4.17 overall) in 2013). He mentioned a few things, but one that struck me was his suggestion that rookie umpires calling a larger “AAA strike zone” might have something to do with it. Of course, that’s something we can examine using some empirical evidence. Using this Hardball Talk article as a guide, I identified the seven new umpires this year. (Note that they are new to being full-fledged umps, but had worked a number of games as substitutes over the last several years.) I then pulled umpire strike zone maps from the highly useful Baseball Heat Maps, which I’ve put below. Each map shows the comparison between the umpire* and league average, with yellow marking areas more likely to be called strikes and blue areas less likely to be called strikes by the umpire. * I used the site’s settings to add in 20 pitches of regression toward the mean, meaning that the values displayed in the charts are suppressed a bit. The picture is now a bit murkier; just based on visual inspection, it looks like rookie umps call a few strikes more than average on pitches outside the zone, and maybe call a few extra balls on pitches in the zone, so we’d read that as nearly a wash, but maybe a bit on the strike side. A different way of thinking about it is that the rookie umps have worked 155 games, so they’ve given up an extra strike every 8 or so games, or every 16 or so team-games. If the change in offense is 0.07 runs per team-game, that’s about one strike per game. So these calculations, heavily unadjusted, suggest that rookie umpires are unlikely to account for much of the decrease in scoring. So, we have three different imperfect calculations, plus a hearsay back of the envelope plausibility analysis using BIS’s estimates, that each point to a very small effect from rookie umps. Moreover, rookie umps have worked 8.3% of all games and 8.7% of Red Sox games, so it seems like an odd thing for Farrell to pick up on. It’s possible that a more thorough analysis would reveal something big, but based on the data easily available I don’t think it’s true that rookie umpires are affecting offense with their strike zones. This entry was posted in Baseball, Oddities, Splits and tagged saberseminar, strike zone, Umpires on August 23, 2014 by clownhypothesis. Do Platoon Splits Mess Up Projections? Quick summary: I test the ZiPS and Marcel projection systems to see if their errors are larger for players with larger platoon splits. A first check says that they are not, though a more nuanced examination of the system remains to be conducted. I will be giving a short talk at Saberseminar, which is a baseball research conference held in Boston in 10 days! If you’re there, you should go—I’ll be talking about how the strike zone changes depending on where and when games are played. Right now I’m scheduled for late Sunday afternoon. Sorry for the lengthy gap between updates; work obligations plus some other commitments plus working on my talk have cut into my blogging time. After the A’s went on their trading sprees last week at the trading deadline, there was much discussion about how they were going to intelligently deploy the rest of their roster to cover for the departure of Yoenis Cespedes. This is part of a larger pattern with the A’s as they continue to be very successful with their platoons and wringing lots of value out of their depth. Obviously, when people have tried to determine the impact of this trade, they’ve been relying on projections for each of the individual players involved. What prompted my specific question is that Jonny Gomes is one of those helping to fill Cespedes’s shoes, and Gomes has very large platoon splits. (His career OPS is .874 against left-handed pitchers and .723 against righties.) The question is what proportion of Gomes’s plate appearances the projection systems assume will be against right handers; one might expect that if he is deployed more often against lefties than the system projects, he might beat the projections substantially. Since Jonny Gomes in the second half of 2014 constitutes an extremely small sample, I decided to look at a bigger pool of players from the last few years and see if platoon splits correlated at all with a player beating (or missing) preseason projections. Specifically, I used the 2010, 2012, and 2013 ZiPS and Marcel projections (via the Baseball Projection Project, which doesn’t have 2011 ZiPS numbers). 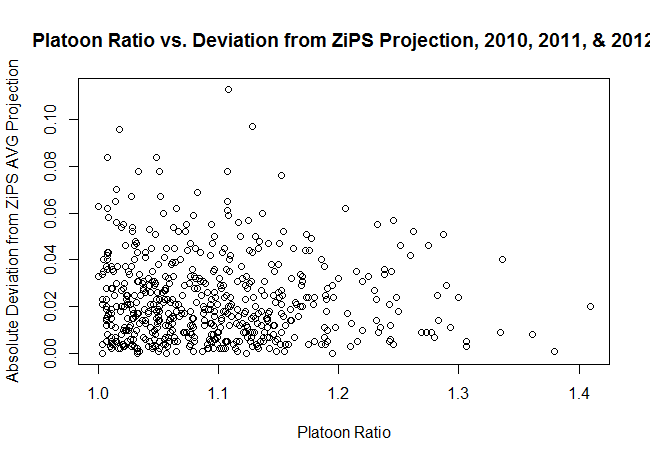 So, once I had the projections, I needed to come up with a measure of platoon tendencies. Since the available ZiPS projections only included one rate stat, batting average, I decided to use that as my measure of batting success. I computed platoon severity by taking the larger of a player’s BA against left-handers and BA against right-handers and dividing by the smaller of those two numbers. (As an example, Gomes’s BA against RHP is .222 and against LHP is .279, so his ratio is .279/.222 = 1.26.) My source for those data is FanGraphs. 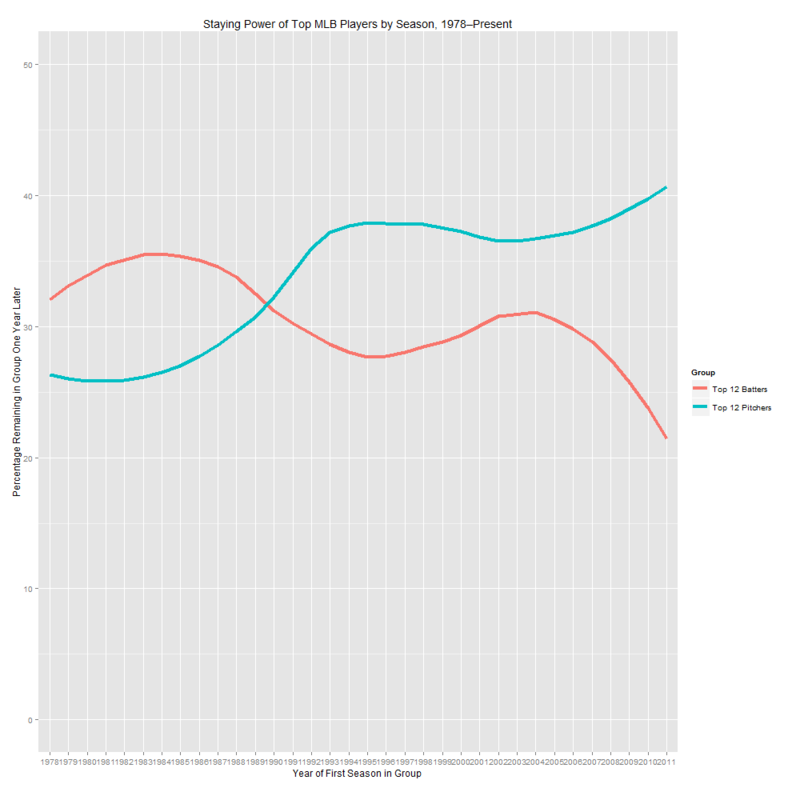 I computed that severity for players with at least 500 PA against both left-handers and right-handers going into the season for which they were projected; for instance, for 2010 I would have used career data stopping at 2009. 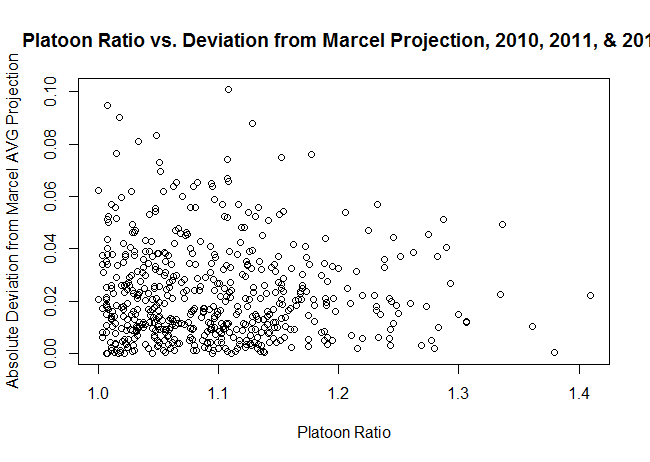 I then looked at their actual BA in the projected year, computed the deviation between that BA and the projected BA, and saw if there was any correlation between the deviation and the platoon ratio. (I actually used the absolute value of the deviation, so that magnitude was taken into account without worrying about direction.) Taking into account the availability of projections and requiring that players have at least 150 PA in the season where the deviation is measured, we have a sample size of 556 player seasons. It only looks at two projection systems; it’s possible this problem arises for other systems. It only looks at batting average due to data availability issues, when wOBA, OPS, and wRC+ are better, less luck-dependent measures of offensive productivity. Perhaps most substantially, we would expect the projection to be wrong if the player has a large platoon split and faces a different percentage of LHP/RHP during the season in question than he has in his career previously. I didn’t filter on that (I was having issues collecting those data in an efficient format), but I intend to come back to it. So, if you’re looking for a takeaway, it’s that large platoon-split players on the whole do not appear to be poorly projected (for BA by ZiPS and Marcel), but it’s still possible that those with a large change in circumstances might differ from their projections. This entry was posted in Baseball, Platoons, Research, Splits and tagged Baseball, baseball strategy, platoon splits, projections on August 8, 2014 by clownhypothesis. Short summary: I look at how much year-over-year persistence there is in the lists of best position players and pitchers, using Wins Above Replacement (WAR). It appears as though there is substantial volatility, with only the very best players being more likely than not to repeat on the lists. In the observed data, pitchers are slightly more likely to remain at the top of the league than position players, but the difference is not meaningful. Last week, Sky Kalkman posted a question that I thought seemed interesting. Sky’s Theorem: the group of aces has a half-life of two years. If you’re an ace, 50/50 you’re one in two years. Anyone want to research it? Obviously, this requires having a working definition of “ace,” for which Kalkman later suggests “the top dozen-ish” pitchers in baseball. That seems reasonable to me, but it raises another question: what metric to use for “top”? I eventually wound up using an average of RA9-WAR and FIP-WAR (the latter being the standard WAR offered by FanGraphs). There are some drawbacks to using counting stats rather than a rate stat, specifically that a pitcher that misses two months due to injury might conceivably be an ace but won’t finish at the top of the leaderboard. That said, my personal opinion is that health is somewhat of a skill and dependability is part of being an ace. I chose to use this blend of WAR (it’s similar to what Tangotiger sometimes says he uses) because I wanted to incorporate some aspects of Fielding Dependent Pitching into the calculations. It’s a bit arbitrary, but the analysis I’m about to present doesn’t change much if you use just FIP-WAR or plain old FIP- instead. 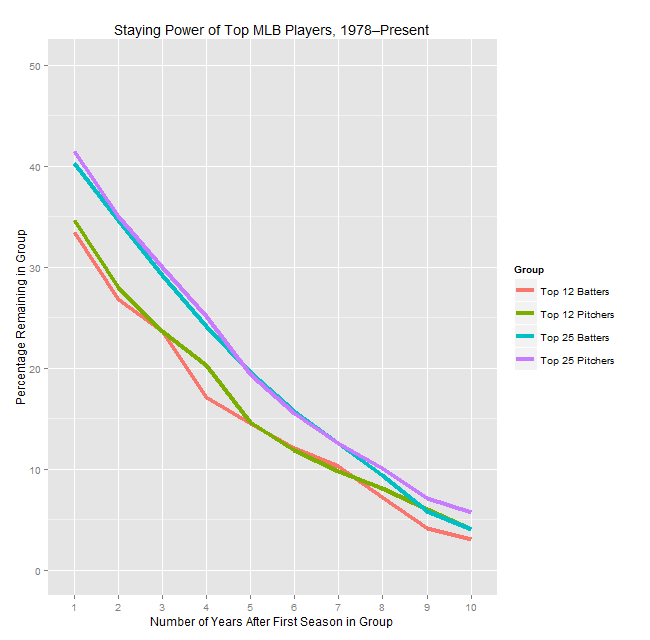 I also decided to use the period from 1978 to the present as my sample; 1978 was the expansion that brought the majors to 26 teams (close to the present 30), keeping the total pool of talent reasonably similarly-sized throughout the entire time period while still providing a reasonably large sample size. So, after collecting the data, what did I actually compute? I worked with two groups—the top 12 and top 25 pitchers by WAR in a given year—and then looked at three things. I first examined the probability they would still be in their given group the next year, two years after, and so on up through 10 years following their initial ace season. (Two notes: I included players tied for 25th, and I didn’t require that the seasons be consecutive, so a pitcher who bounced in and out of the ace group will still be counted. For instance, John Smoltz counts as an ace in 1995 and 2005 in this system, but not for the years 2001–04. He’s still included in the “ace 10 years later” group.) As it turns out, the “half-life” that Kalkman postulates is less than a year: 41% of top 25 pitchers are in the top 25 the next year, with that figure dropping to 35% for top 12 pitchers who remain in the top 12. I also looked at those probabilities by year, to see if there’s been any shift over time—basically, is the churn greater or less than it used to be? My last piece of analysis was to look at the probabilities by rank in the initial year to see how much more likely the very excellent pitchers are to stay at the top than the merely excellent pitchers. Finally, I ran all of these numbers for position players as well, to see what the differences are and provide some additional context for the numbers. I played around and ultimately decided that some simple charts were the easiest way to convey what needed to be said. (Hopefully they’re of acceptable quality—I was having some issues with my plotting code.) We’ll start with the “half-life” graph, i.e. the “was this pitcher still an ace X years later?” chart. As you can see, there’s a reasonable amount of volatility, in that the typical pitcher who cracks one of these lists won’t be on the same list the next year. While there’s a small difference between pitchers and position players for each group in the one year numbers, it’s not statistically significant and the lines blur together when looking at years further out, so I don’t think it’s meaningful. This is a very chaotic chart, so I’ll explain what I found and then show a slightly less noisy version. The top 25 groups aren’t correlated with each other, and top 25 batters isn’t correlated with time. However, top 25 pitchers is lightly positively correlated with time (r = 0.33 and p = 0.052), meaning that the top of the pitching ranks has gotten a bit more stable over the last 35 years. Perhaps more interestingly, the percentage for top 12 pitchers is more strongly positively correlated with time (r = 0.46, p < 0.01), meaning that the very top has gotten noticeably more stable over time (even compared to the less exclusive top), whereas the same number for hitters is negative (r = -0.35, p = 0.041), meaning there’s more volatility at the top of the hitting WAR leaderboard than there used to be. The upshot of these graphs, though, is that (if you buy that the time trend is real) the ace half-life has actually increased over the last couple decades, and it’s gone down for superstar position players over the same period. What I take away from these charts are that, unsurprisingly, the very best players tend to persist in the elite group for multiple years, but that the bottom of the top is a lot less likely to stay in the group. Also, the gaps at the far left of the graph (corresponding to the very best players) are larger than the gaps we’ve seen between pitchers and hitters anywhere else. This says that, in spite of pitchers’ reputation as being volatile, at the very top they have been noticeably less prone to large one-year drop offs than the hitters are. That said, the sample is so small (these buckets are a bit larger than 30 each) that I wouldn’t take that as predictive so much as indicative of an odd trend. This entry was posted in Baseball, Research and tagged aging, Pitching, pitching statistics, WAR on July 14, 2014 by clownhypothesis.